Avoiding the Bazillion Dollar Annual | Tennessee Aircraft Services, Inc. Most of us have experienced that dreaded annual with thousands of dollars in repairs to items we thought were in perfectly good shape. How does this happen? Have I been flying illegally all this time, or worse, unsafe? How did such a small item become a huge expense? The really big question; how am I going to explain this to my spouse? Personally, I recommend off shore bank accounts for everything airplane related and all communications mailed in nondescript plain brown envelopes. It’s best to begin at the beginning, so to speak. Before you purchase your plane, be adamant it receives a good pre-purchase evaluation by a model specific knowledgeable mechanic. He/she will spend less time researching the details and more time looking at the airplane. A knowledgeable mechanic can find most of those deferred maintenance items fairly easily. It is common for an owner to begin short cutting expenditures some time before he/she contemplates selling. Most of these deferred items are small things, but they can quickly add up to big ticket values. Buying someone else’s problems is OK as long as you know what you’re getting. If you’ve already purchased a plane, you may need to brace yourself. For what ever reason, if you’ve been getting a great bargain on your inspections, don’t be surprised when it catches up to you. Keep in mind we are talking about hand made machines that are being subjected to torturous bending, twisting, vibrating, heat, cold, old age, cola spills-you name it. One must expect wear and tear, know where and what to look for, when to mitigate failure, and how. Continuous deferral, knowingly or unknowingly, is just delaying the inevitable and likely increasing its cost. There are all sorts of reasons why mechanics don’t note issues during an inspection; They may be afraid of losing your business if the cost is too high, they have other jobs coming in and don’t have time to fix everything right now, they don’t know enough about your model airplane to know where to look, or maybe you’ve intimidated them into passing off marginal items as airworthy. After handing a first time customer his post inspection repair list estimate, he proceeded to “bless me out” over the proposed cost to bring his Skyhawk up to airworthy condition and complained about how my nitpicking would force him out of flying. I apologized and explained I could not base the cost of the repairs on his ability to pay. Unfortunately, some mechanics will succumb to this type of pressure and short change themselves or worse, compromise safety. Control yoke severely worn and scraped due to roller guides in the instrument panel not being adjusted properly. An hour or two of adjustment early on would have prevented an expensive replacement. One of the most challenging parts of aircraft maintenance is scheduling. In the mass produced world of the automobile, every conceivable repair has a known time frame for completion. By its very nature, an annual inspection is looking for the unknown. We can easily schedule the 17 man hours to complete an inspection on a 182 but we can’t make advance scheduling for unknown repair items. Those two days planned for the inspection easily turns into twice that if just one cylinder is discovered with a bad valve. The next plane scheduled in the shop must now be put off at least a couple of days. As this process is repeated the backlog quickly piles up at the front door. While the one plane takes up hangar floor space waiting for parts, the next job sits in the rain on the ramp waiting its turn. In the mean time no work gets done or invoiced. One option is to block five days on the calender for each fixed gear single and maybe eight working days for a high performance single. Sounds reasonable, but what if that magic 182 shows up with no discrepancies and the shop sits idle for three days. Most shops are already on the financial fringe, and just a few days of no work is a huge problem. Most mechanics in the GA piston world are forced by economic realities to be a generalist. That means they must be willing to work on whatever make and model comes along. This is convenient for the owners but a potential problem for the quality of the inspection. It requires a good bit more effort on the mechanic’s part to be up on all the nuances of the plane being inspected when it is outside their make and model comfort zone. There is also more opportunity for obscure model specific items to get passed on to the next inspection. It’s always better to have a model specific knowledgeable mechanic perform your inspection. Cessna Pilots Association Tech Note #009 is a very good listing of items often missed or skipped during an inspection. It’s a “short” list of only 129 items. Too often I must contact an owner about discrepancies found that could /should have been taken care of years ago. Instead, a whole boat load of problems have to be dealt with all at once. No single one would be a major financial hit, but cumulatively they become monumental. 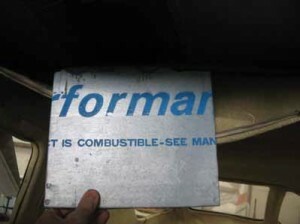 The Cessna 152 Service Manual special inspection item list calls for flexible hose replacement at five years. Most of the other Cessna manuals have similar statements. The same hose types installed on other brand airplanes will have factory replacement recommendation times of eight and even ten years. I frequently find flexible hoses over thirty years old. I can see someone letting them go fifteen years, but thirty? The rubber in the hoses deteriorates over time just like the tires. When they start coming apart, all those little particles go flowing all through whatever system to which the hose is attached . You could save a few hundred, maybe a thousand, by holding off on hose replacement. At risk might be the brake master cylinder ($), or the hydraulic power pack ($$$), or the engine ($$$$$$$). We’ll leave off the morbid discussion about potential engine failure. Low cylinder compression checks often cause an overreaction and premature cylinder removal. Before that expensive course is taken, some basic troubleshooting should be done. The simplest thing to do is take a look inside. A borescope, or simple videoscope, can be used to visually inspect the exhaust valve, cylinder walls, piston top, and cylinder head interior. Actual data can be gained, allowing an educated decision. I’d hate to remove a cylinder only to find a small piece of carbon on the valve seat. I’d be even less happy to leave the cylinder on the engine and discover the valve was bent and it eventually failed, taking out the piston and the turbo. 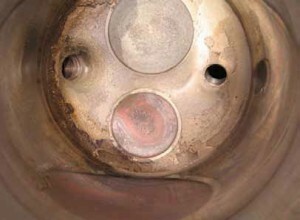 Burned exhaust valve found during a routine borescope inspection. This example taken from a turbocharged 210. 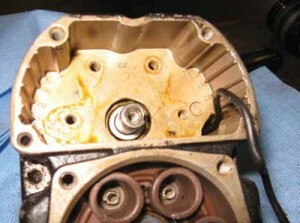 Failure of the valve would have damaged the piston, cylinder, and turbocharger. That’s a lot more money than just a valve replacement. 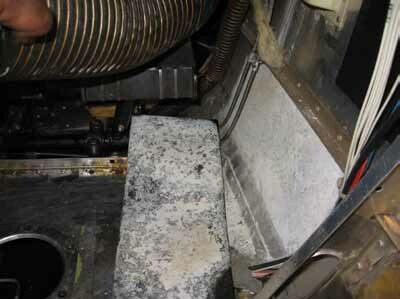 It is difficult to see inside the deep dark reaches of an engine. Oil analysis allows a pretty good view, but some still choose not to use them. Just because one is unaware a cam lobe is destroying itself, and the lifter body riding on it, doesn’t mean it’s not happening. Ignored, the need for an expensive engine tear down can turn into engine destruction. Sorry, I’m trying to stick to money issues and stay away from the morbid. Sometimes the really cheap stuff can cause big problems. Those old black air hoses in the wing roots and overhead areas of most of our single engine Cessnas is a great conduit for moisture. These CAT hoses are made of neoprene impregnated fiberglass cloth with a copper coated steel wire spiral wrapped on the inside to hold the tubular shape. They typically carry outside air for cabin cooling and cabin heating. Over time, the moisture laden air will attack the hose and destroy it. A hole in the cloth allows that moisture to access areas of the plane not designed to deal with it. An exposed rusted wire of a CAT hose can cause expensive damage to anything to which it comes in contact. An early look where one of these small hoses lays on top of the lower wing attach pin fittings on a cantilever winged 210, may save many thousands. As the hose deteriorates, the metal clamp holding it away from the wing attach fitting fails. The hose now lays directly on the fitting, causing it to corrode. Catch it early and just a little sanding and priming will fix it. Put it off or miss it all together due to an abbreviated inspection and the structure is weakened until – “dang” – sorry, I meant to stick with money issues. 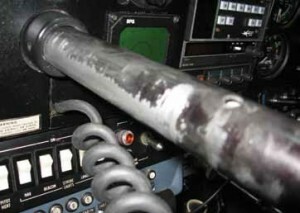 Lower right side panel corrosion under a sound suppression panel caused by moisture blowing through a rotten CAT hose. While we’re talking about corrosion, fogging the airframe with a corrosion inhibitor works great but not in the cabin. The cabin area is often ignored because it requires removal of a lot of interior panels, headliner, and carpet. A simple solution is to wet a cloth with the corrosion treatment and reach in behind the panels and wipe down the area manually. It’s a messy job, but little effort, and you’ll reap large future benefits. A magneto rarely gives warning of impending failure; one flight it works and the next it doesn’t. Industry experience shows Slick or Bendix mags are likely to do well for at least 500 hours, then you are on borrowed time. You may not detect wear, but it is happening none the less. Putting off needed magneto service is asking for problems in other areas as well. When magneto points get too close together, starting becomes more labored shortening the life of the starter motor. 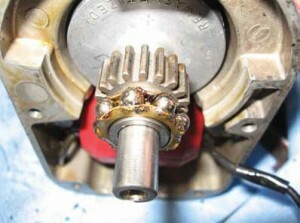 Tired coils provide weaker spark at the plug, causing inefficient fuel burn. There are other problems that will cost you money if service is postponed but mostly, reliability is your loss. Engine oil noted in a magneto. 500 hour magneto check had been deferred for a few hundred hours. Definitely not where engine oil should be. Same magneto showing the bearings totally dry. Dry bearings create extra heat and stray metal particles, among other bad stuff. There are ways to save money on aircraft maintenance but substituting unknown commercial products is not one of them. It may look the same and feel the same but proof is in the specifications and approved data. If you’ve not installed unknown materials be sure your predecessors didn’t as well. Everyone wants a really quiet cabin, and you can find really neat insulation at the local building supply house. You may be surprised what happens when you put a match to some of those materials. If you plan on spending hours and hours performing owner maintenance, at least use approved parts so you don’t have to do it twice. Insulation found in a 210B. Does the notation on the panel give you any reason for concern? If there is an access panel installed by the factory, there is something behind it to inspect. That’s why it’s there. If your mechanic doesn’t want to take the time to look, you should. If nothing else, you can ensure no corrosion has started under that floor panel since the last inspection. While you’re under the floor, clean all the gunk off the inside of the belly skin. If you can’t see the structure, how can you inspect it? I’ve spent several hours just getting years of neglected goo out of the belly of a 172 so the inspection could be completed. This is an area tailor made for an owner to save a lot of labor expense. Preventive servicing is usually simple, inexpensive, and reaps big long term benefits. Once a month or so, walk around your plane and put a drop or two of lubricant on anything that pivots. When aileron hinges, rod ends, elevator hinges, and such get dry, the dirt and grime act as a serious abrasive and the part basically self destructs. A few drops of proper lubricant flushes the grit out and smooths operation. You can easily double the life of these items with a little lube and even more if your plane parks outside. If it moves, squirt it with something. Maintaining an airplane is an expensive endeavor no matter how you look at it. The purpose is to enhance the safety of yourself and those who fly with you. I admit, the financial part of the formula clouds the issues many times, but safety must always be the overriding concern. The best solution to the financial and airworthiness issues is the same; detailed inspections. Being aware of the airplane’s condition and planning ahead for its care is preferable to waiting for the failure and allowing the plane to dictate the schedule. Hopefully your plane is in good enough shape to endure a detailed inspection without too much wallet withdrawal.